Fleetwood Town manager Steven Pressley says Jamille Matt is yet to fulfil his potential – and he hopes the striker does so at Blackpool. The 26-year-old signed for the Seasiders on Tuesday, having been released by Town last month because Pressley could not guarantee Matt regular football as competition grows in the forward department at Highbury. The Scot has recently snapped up “rough diamond” Aaron Holloway from Wycome and non-league hotshot Ashley Nadesan to compete with last season’s top scorer Bobby Grant, David Ball, Ashley Hunter, Devante Cole and Declan McManus. Pressley says it was a mutual decision for Fleetwood and Jamaican Matt to part ways after three and a half years. He said: “It was not just a one-way decision. Jamille was at a stage where he wanted to play first-team football and obviously we were not providing him with that. “That’s what every player wants but we could not give him that platform as we have better players in that position – but that is no slight on Jamille. 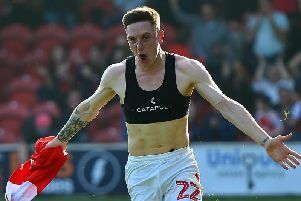 Matt’s time on the Fylde coast has been blighted by injury, though he ended the season in fine form – his seven goals in 14 games on loan helped fire Plymouth Argyle to the League Two Play-off Final. And Matt is now keen to prove a point and embark on a promotion campaign with Blackpool. The striker said: “It is one of the worst moments in football losing in a play-off final (Wimbledon defeated the Pilgrims at Wembley), but that is something that will drive me on next season because I never want to feel like that again. “I just want to try to get promotion. I showed a bit of what I can do at the end of last season. And target man Matt thinks his physical style of play can provide something different to Pool’s current forward trio of Mark Cullen, Jack Redshaw and Danny Philliskirk. He said: “I like to think I’m physical, a threat all the way through the game. I try to play quite high and occupy centre- halves. “I think the strikers who are here at the club will compliment my play, and hopefully we can score a few goals and be at the top of the table.